Mr. Iler worked in the private sector as a production manager engineer. After six years he returned to school and obtained his Juris Doctorate in 1980 and became a partner at Kartvedt, Iler & Smith, a San Diego law firm specializing in personal injury and worker’s compensation. In 1983 he became a founding partner in the firm of Shaffman, Iler & Foley which in 1986 became Shaffman, Iler, Palkowitz & Doft. 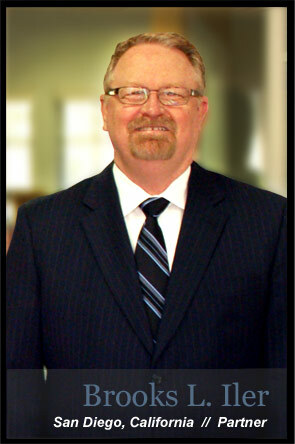 In 1997 Brooks formed Iler & Iler, LLP with his brother Virgil Iler. In a practice that has spanned twenty-nine years, Mr. Iler has acquired extensive experience in the litigation of many injury, wrongful dealth and insurance claim cases. During the past several years he has also represented numerous individuals in their claims for Long Term Disability benefits (both group and private plans). America v. Ward, (97-1868) 526 U.S. 358 (1999). A unanimous decision written by Justice Ginsburg concluded that California’s “Notice Prejudice” rule was not preempted by ERISA law. Mr. Ward finally received his disability benefits after an eight year battle. In Consolidated American Insurance Company v. Mike Soper Marine Service, 951 F.2d 186 (1991) Mr. Iler represented an injured worker who lost an arm in a crane accident. Mr. Iler obtained a judgment from the District Court and successfully defended the court ruling before the Ninth Circuit Court of Appeal, resulting in a ruling upholding an insurance company’s duty to defend its insured when the possibility of coverage exists. In Kirby v. Southern California Edison Company, 78 Cal.App.4th 840 (2000) Mr. Iler represented a mother who lost her son when he was electrocuted by a downed power line owned by Southern California Edison. Two days after her son’s death Ms. Kirby signed a settlement release for $2,500, which Mr. Iler argued was unenforceable. Mr. Iler was successful in his appeal of a San Bernardino Superior Court Judge’s decision to throw out her case on the basis of the settlement release. The Fourth District Court of Appeals agreed with Mr. Iler and remanded the case for a trial on its merits after which the case was successfully resolved.